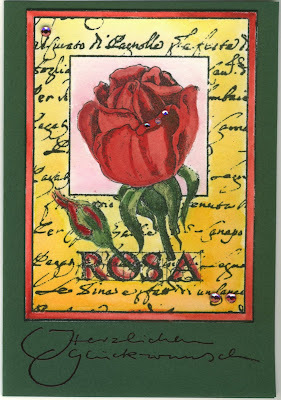 I was asked to create a card for a 50th birthday with some rose image. I chose this old stamp (Sugarloaf) which I haven't used for a while, stamped it onto watercolor paper and colored it with Twinkling H2Os. The sentiment (Abracadabra) is embossed with burgundy embossing powder. Finally I added some rhinestones. 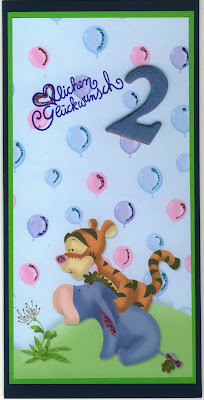 A neighbour needed a card for a 2nd birthday - so I finally decided to cut up my beloved Disney paper (by Studiolight)... I just stamped the sentiment (Happy Birthday by Kaleidoskop) and added a chipboard number which I first coated with Rose Lumiere paint, then covered with Ranger crackle paint. And I added LOTS of Stickles, LOL! A fun card! This is a very quick and easy Thank You card I made today. I wanted to try my new border punch (CreaMotion), and then I thought the border was so beautiful that I felt I shouldn't add too much else on the card. So I just stamped the sentiment (Thank You by Stempelbar) and added a punched flower (EK Success LARGE flower punch) with some primas. This is the classical card. 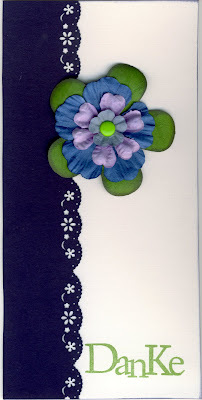 I used my cuttlebug embossing folder with color-core cardstock, then added some Versamark Dazzle Frost ink. 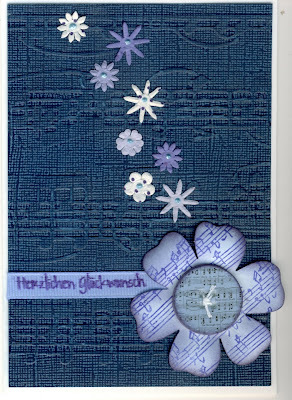 I stamped a large music sheet (JudiKins) onto light blue paper, punched out a flower (EK Success large flower punch), added a music button (Rebecca Sower Designs) and a light blue ribbon on which I stamped the sentiment (Happy Birthday by Stempelmeer). Finally, I added some tiny primas and Perfect Pearls. And this is the rocky birthday card! I must admit that I copied this card from myself, I already stamped the same design last weekend for a stamping friend, and as I liked the black-white-red color combo and the image, I wanted to do it again! Images by Inkadinkado, swirl by InnovativeStampCreations. 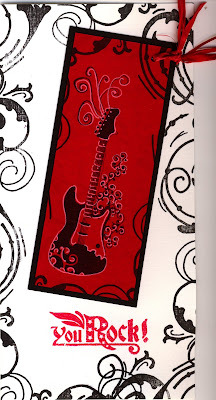 The image is stamped with Palette Noir onto red cardstock, then I added highlights with a white jelly pen.